I started visiting graveyards by accident. A series of missed connections during the first Gulf War resulted in an unanticipated layover in London, where I just happened to pick up Victorian Valhalla, a guidebook to Highgate Cemetery. My husband Mason wanted to visit the graveyard because John Gay’s photos made it look so pretty. In reality, Highgate was ravishing, full of dramatic marble angels taking wing. As it happened, one graveyard led to another. Mason and I decided to visit Père Lachaise in Paris because so many famous people came to rest there. 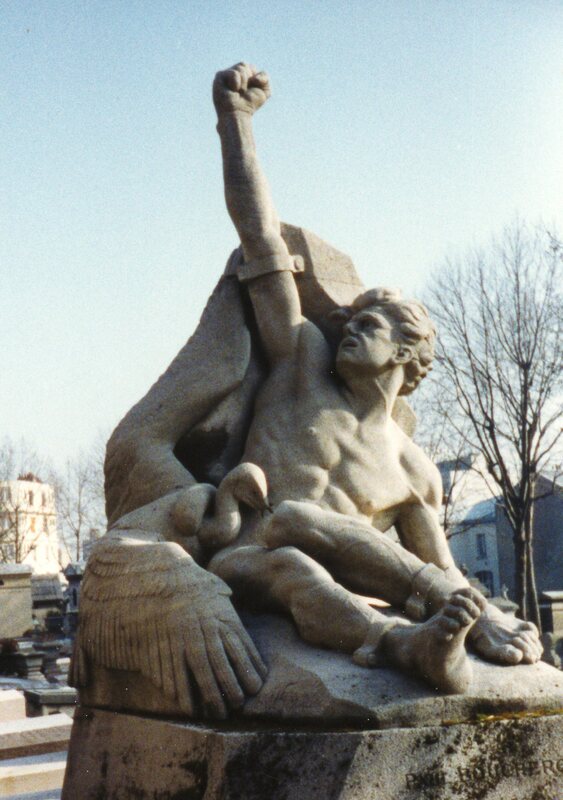 As we wandered, we accidentally discovered my favorite grave marker in all the world: shackled in the granite, Prometheus raises one fist against the gods. If that doesn’t sum up my feeling about death, I don’t know what might. So I started looking at graveyards because they were pretty, then because famous people rested there. I quickly learned that practically anonymous gravestones tell the best stories. I developed a fascination with history as reflected in burial grounds, which led to studying trends in mortuary decoration. You can say I’m a cemetery aficionado. I don’t mind. I try to list a new Cemetery of the Week each Wednesday. These are brief encyclopedia entries, something to give the flavor of a particular graveyard — enough to whet your appetite for travel — illustrated with my photographs or postcards from my collection. In my travels, I’ve discovered that graveyards are really very fragile. All it takes is a windstorm, a flood, or a fallen tree to do irreparable harm, not to mention the kind of damage a determined teenager can do. Cemeteries are vulnerable if they are not visited. My mission is to get people to go. The least I can do for the pleasure cemeteries have given me is to inspire and encourage other people to visit for themselves. People protect the things they love. With any luck and the right guidance, you’ll find something to love in a cemetery, too, whether it’s historical figures, beautiful statuary, wildlife, breathtaking scenery, or what have you. If you need more inspiration, 199 Cemeteries to See Before You Die is coming out in October 2017. It’s available for preorder at Amazon. How to be safe in the cemetery. What Cemetery Aficionados call themselves. My 7 Links: some of my blog posts that I think rate more attention. My view on cemetery antiques for sale. The Death’s Garden Revisited essays. Thanks for stopping by, Mark. Your Pere Lachaise book looks like a beautiful project. Good luck raising your funding! Loren, what an intriguing window on how we commemorate life and death! I’ve always been fascinated by cemeteries, too. My hometown used to hold a cemetery “open day” once a year, encouraging people to picnic in the grounds. I thought it was creative and so healthy… addressing myths and helping to ally a few fears into the bargain. I had a wonderful visit to “La Recoleta” cemetery in Buenos Aires a few years ago. Of course, you have to hunt to find Eva Peron’s grave, but you see the most amazing tributes along the way. How we bury our dead says so much about us as a culture. I’ll be back! Cheers, Alicia. I would love to go to Recoleta someday. I’m envious! Thanks so much for sharing your memories, Alicia. Everywhere I go I try to look for the oldest graveyard in the area. Thanks for sharing. Take care. I’ve nominated you for The Sunshine Award! You can see my post here: http://pennilesstraveler.com/2012/08/25/the-sunshine-award/ Congrats!! When I was a kid a cemetery abutted our back yard and we would play on the graves. I wouldn’t do that now, but I have always loved these places, and, like someone above, tend to look for the old ones when I travel. This makes me think I must put together a set of cemetery photos…thank you for taking people on this journey! For some reason I just got notification of this 5-yr-old comment! And I haven’t managed to put that set together, but will try to save your info and send a link when/if I do. Wonderful site! Thank you for sharing your interest and curiosity. I am also love cemeteries and enjoy visiting as many as I can. I posted a link to your site on my “Early Gravestones” Facebook page. Thanks, Laura. I love your site, too. Thanks for visiting my site and liking the Little Gracie Watson, Bonaventure Cemetery post. I just started my blog and have so much to learn and do, so thanks for the like. I love your site and frankly there is nothing I like better than traipsing around a cemetery. You have an Awesome site! Thanks! I’m a little obsessive about cemeteries. 🙂 I look forward to more of your posts.